Museum Series Claybord™ is made using 1/8" true artist hardboard and features Ampersand’s simply amazing kaolin clay ground formula similar in paintability to the clay gesso grounds used during the Renaissance. The surface is sanded to an ULTRA-smooth, highly absorbent finish so your paint colors remain true and brilliant. Work the surface by thinly applying paint or ink, then remove it, reapply it, even scratch through it to add contrast, texture and fine details. Claybord is a favorite of both fine and graphic artists. Only Ampersand builds their cradles by hand with premium grade 13-ply birch plywood for maximum stability and a clean, finished look from edge to edge. Choose from 3/4", 1.5" and 2" Deep, all made in the USA. 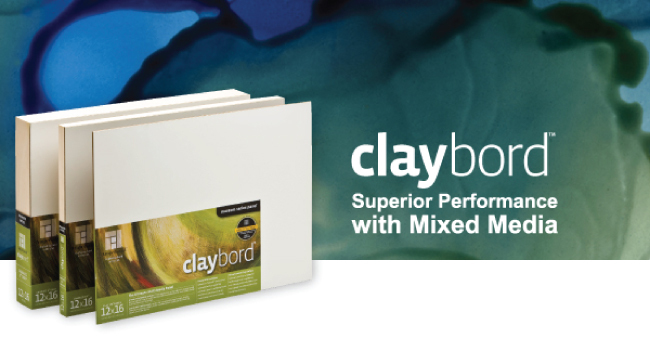 We used to recommend Claybord™ for encaustic painting. Now we have a surface called Encausticbord™ that is rigid, absorbent, heat resistant and made especially for the unique demands of encaustic painting. No other panel on the market protects an artist’s work like an Ampersand™ panel. Every Claybord™ panel is protected by our proprietary Archival-Seal™ barrier technology, the most advanced formula for sealing wood that prevents support induced discoloration. Only Ampersand™ uses true high-density hardboard made from US-grown renewable Aspen wood fibers. Claybord is archival, eco-friendly, formaldehyde-free and made by hand in the USA. Read more about the hardboard we use and why we’ve found it to be a better substrate. With Claybord, paints and inks can be manipulated to vary tonal value, create detail and to develop highlights and correct mistakes. Various artist tools can be used such as Ampersand scratchboard tools, hobby knives, razor blades, etching tools, sand paper, oil-free steel wool, and electric erasers. Claybord's clay coating allows for the use of sgraffito techniques to cut into the surface and re-expose the white clay ground. The coating is 7 to 10 dry-mils thick allowing for multiple cut-ins or erasers. The smooth finish and the absorbency of the clay ground allows the use of an abrasive like oil-free steel wool or sand paper to remove pigment without damaging the finish. Claybord’s inventor Charles Ewing demonstrates his process for using India inks in an additive and subtractive process here.